My third marathon began Saturday night without much in the way of expectations, other than to have fun – but I try to do that with most things since that’s one of my five rules for life (#3 relax and have fun). 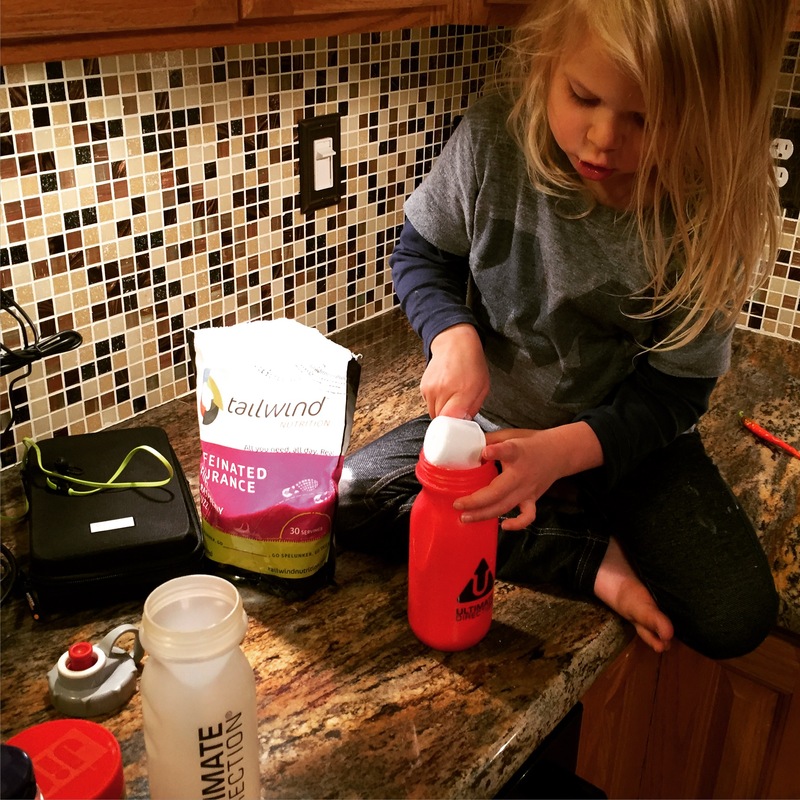 My number one fan helped me prep by mixing up my Tailwind and slopping some peanut butter on slice of bread for my pre-race PBJ. Early to bed, and early to rise. 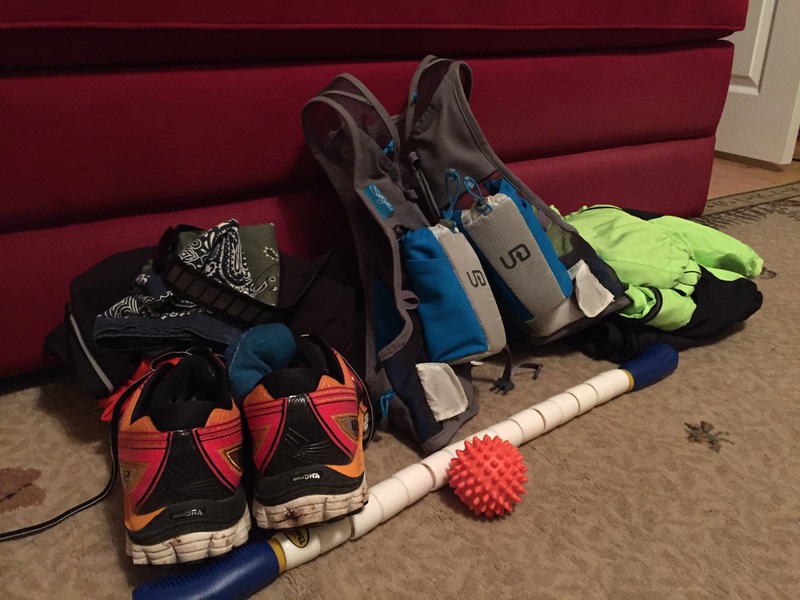 My alarm woke me at 4am and I went through my normal pre-run routine of pulse / weight / water, slipped in to make sure the girls were tucked in and covered up, then shuffled downstairs to gear up for the chilly morning ahead. I enjoyed my pre-race PBJ, did some light stretching, double checked my list and then it was North to Grand Rapids. What a beautiful starry night morning (it just felt like night). It was cold though – just 28 degrees. Don’t get me wrong, I live in Michigan and I’ve run for hours in below zero degrees, but I still have my summer blood and 28 seemed cold over the weekend. 45 minutes later, I pulled into the parking lot at the YMCA and walked in to pick up my packet and bib. 1441 – I liked that number. I spent the next hour, or so, sitting in the jeep – heat blowing, listening to my ‘pre-chill’ mix on Spotify, visualizing the race and making sure I had everything in order. After that, I did some light jogging and made my way over to the starting chute to stretch. 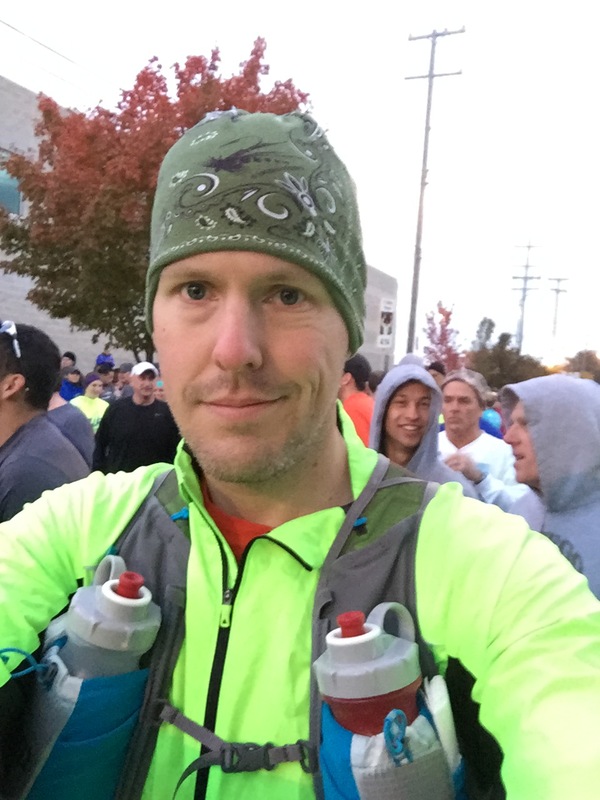 Here was my one and only big decision – do I run in my jacket? I’d already shed the pants and was running in shorts. I decided to keep the jacket on right up until the start and then stuff it in my UD vest. I positioned myself behind the 3:56 pace group and waited for the race to start. I was strangely calm – no nerves. Just calm and ready to run. I rolled across the starting line about a minute, or minute and a half, after the ‘gun’ and about 200 yards behind the pace group. Mile 1 -> Slowest of the race (sweet – I didn’t go out too fast!). I actually fell further back from the pace group. Things were crowded and I was enjoying a slow warm up. I recall a guy taking a selfie of himself about 1/2 mile in and a lady asked me what our split was when we hit mile 1. Mile 2 -> I sped up during the second mile, but was still pretty far back from my pace group. I was ok with this – plenty of race to go and I felt good. Toward the end of the second mile I noticed a couple gals behind me discussing a new house. After a couple minutes I realized – hey, I know her! Mile 3 -> Faster yet. Erin catches me and says ‘hello’ and I respond ‘hey, I thought I heard you back there!’ We run for a bit and I tell her I’m going to drop back. I’m running quicker than I should be. She says it looks like I’m walking. I guess that’s a compliment? In any case, I feel good, but I didn’t want to run out of steam early. Miles 4 and 5 -> So much for slowing down. These are my fastest (along with mile 10) of the race. I’m feeling good so I figure I might as well try to close the gap with the pace group. These are the last two miles as we leave downtown toward the Butterworth Park. Miles 6 thru 9 -> Butterworth Park is crowded. The trail doesn’t seem quite wide enough for all the runners. I think the 3:56 group is a popular one and that might’ve been part of the reason for the congestion. I’m still closing on them. Somewhere in this stretch I see the guy leading the half coming BLAZING back in the other direction. If I thought it was crowded going with the flow, he must’ve been pissed trying to win the race in the opposite direction. I saw Erin again toward the end of this stretch as she broke off to complete the half. She wished me well and she was running strong. I knew she’d have a great finish. Mile 10 -> I finally settle in with the 3:56 pace group with a quick run downhill about half way through this mile. I’m feeling very good at this point. Miles 11 and 12 -> Run through Millennium Park with the 3:56 group and again the trails are tight, but I managed. Once of our pacers had a couple extra waters from an aid station and offered them to the group. I thought that was nice. But not as nice as it would’ve been if he had a Two Hearted Ale. He didn’t. Mile 13 -> I left the pace group. Why the hell not!? I was feeling great! This will come back to bite me. It eventually did. Miles 14 and 15 -> I continued rolling and the miles were still slipping away almost effortlessly. As this point I started actually believing I could break 4hrs today. I was well ahead of that pace and still felt very good. 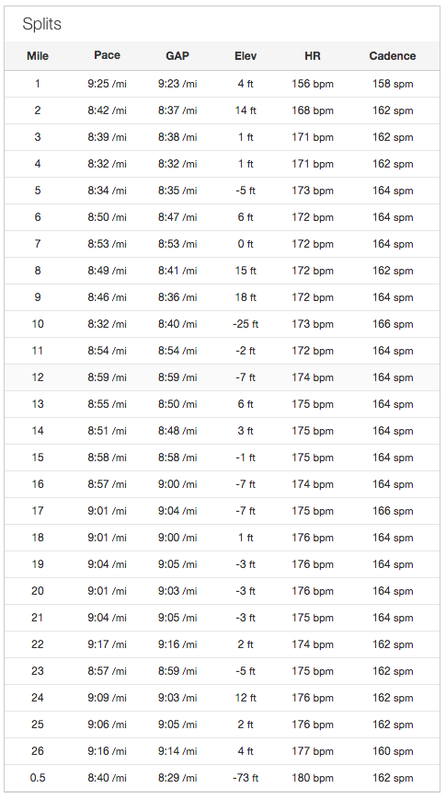 Miles 16 through 18 -> So the feeling good didn’t last long. Mile 16 started a 7 mile out and back section of the race. I wouldn’t say I ever truly felt bad, or down, during the race, but this out and back section was definitely the worst part. It was relatively flat, but we were running on the right side of the road. I’m normally used to running on the left (against traffic). The road was crowned opposite to what I’m used to running and it was hurting my left leg. I did pass one of my work mates heading in the opposite direction. He was smoking right along. A while later I passed a few more of my work mates participating in the My Team Triumph charity run. That helped as well. I stayed ahead of the 3:56 group during this stretch, but I could hear them closing. Miles 19 thru 21 -> Trying as hard as I could (keep running, you’re doing great, don’t slow down!) to keep ahead of the pace group, again along this long stretch of out and back with my left leg hurting. They eventually caught me at mile 21. We rolled through the aid station together and I declined the pickle juice. I tried to hang with them, but I fell back. Mile 22 -> I start trying to do math, yes math!, in my head to see how fast I need to run these last few miles to break 4 hours. I feel like I’m running out of steam big time. Other than the first mile, which was intentionally slow, this was my slowest mile. I feel like I’m crawling along, and the pace group leaving me didn’t help. It was a 9:17. Yeah, slow, but in the scheme of things, not too shabby still. Miles 23 thru 25 -> I’m headed back downtown and through Butterworth Park again. Plenty of room on the trail this time! I remember coming up a hill, out of the woods, and into the park. The sun was shining, I’d just taken a swig of Tailwind and felt a boost and I was rolling! In reality these miles weren’t much faster than the dreaded mile 22, but hey, I felt good now! Mile 26 -> Will this ever end!? Ok, it wasn’t really that bad, but that quickly I was back on the other end of the spectrum. I’d figured out I needed to the last 1.2 in about 14 minutes. No big deal, but it felt like I was running and going no where. I kept thinking – this is awesome, I’m going to break four hours. Followed by – I hope I don’t step in a hole or pull a muscle. Followed by – am I there yet!? The final .2 was awesome – folks lining both sides of the streets cheering. I was passing people left and right. I saw the finish line and the time started with a ‘3.’ I was home free at this point and rolling fast! I grabbed a cup of lemon lime gatorade and chugged it. Except … it wasn’t lemon lime gatorade. It was pickle juice. WTF!!!!? If I had food in my stomach to vomit, I would’ve vomited. The grossness didn’t last long though because I was juiced -> 3:56:47!!! It was a new PR by about 21 minutes. We headed over to the beer tent and enjoyed a free New Holland IPA and chatted about our days under a beautiful sunny blue sky! If I had it all to do over again, would I have changed anything? Perhaps stayed with the pace group a bit longer. Other than that, it was pretty much about as good as it gets for me with a run! Nutrition: 1 PBJ 3hrs prior to the race. 500-600 calories of Tailwind that I sipped each mile. I supplemented my fluid intake w/water at every aid station. 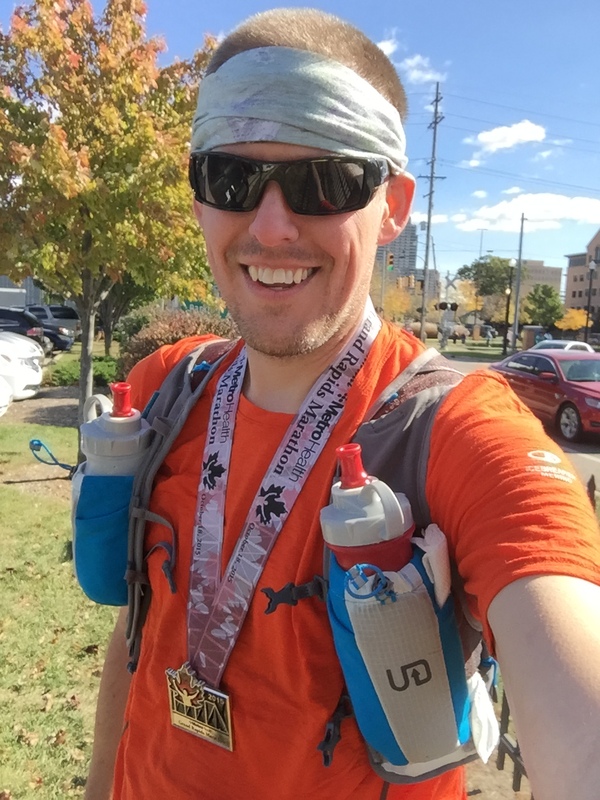 This entry was posted in race report and tagged 26.2, beer, marathon, race on October 20, 2015 by darkskyrunner.